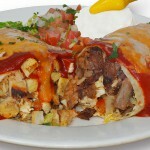 Your choice of chicken, pork or shredded beef, rolled up in a tortilla & deep-fried. 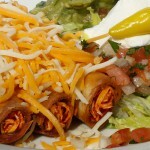 Served with fresh lettuce, fresh pico, guacamole, sour cream, sprinkled with jack & cheddar cheese. 6 oz. of our awesome guacamole, perfect with our homemade chips. 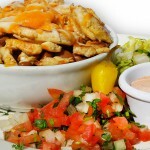 A large plate of our homemade crisp tortilla chips, with refried beans & topped with a mound of jack & cheddar cheese. A large plate of our homemade crisp tortilla chips, showered with refried beans, meat of your choice, a blend of jack & cheddar cheese, fresh pico & garnished with sour cream, guacamole & jalapeños. Asada available at extra charge. Our delicious wings topped with spicy wing sauce, served with fresh carrots, celery and ranch dressing. A blend of fresh salad greens topped with tomatoes & a sprinkle of cheese. A large flour tortilla shell with your choice of meat, homemade refried beans and topped with a mound of fresh salad greens, a blend of jack & cheddar cheese, sour cream & fresh pico. 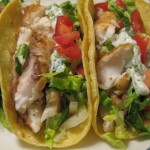 Baja Fish Tostada *WORLD FAMOUS"
A blend of fresh salad greens topped with tender chicken breast, jack & cheddar cheese, fresh pico, avocado slices & ranch dressing on the side. A mix of fresh salad greens with homemade chips, jack & cheddar cheese, fresh pico & pinto beans; topped with sour cream, a sprinkle of cilantro & served with ranch dressing on the side. 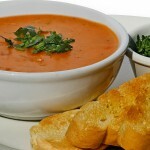 Try it with asada, shrimp or fish of the day at extra charge. Please order by number! Dinners include homemade Spanish rice & refried beans. Two soft corn tortillas topped with meat of your choice, lettuce, cheese, fresh pico & guacamole. A delicious flank steak charbroiled to perfection, garnished with fresh pico, lettuce & guacamole. Served with your choice of tortillas. Fish lightly grilled served with fresh mango salsa, garnished with a blend of fresh cabbage & a twist of lemon and lime. Served with your choice of tortillas. Shredded pork, slow cooked in the traditional mexican style served with rice, beans & tortillas, garnished with fresh pico, lettuce & guacamole. Sautéed with onions, bell peppers & tomatoes, garnished with guacamole, sour cream, fresh pico & lettuce, served with your choice of tortillas. Two homemade chile rellenos topped with a zesty ranchera sauce, a blend of jack & cheddar cheese, fresh lettuce, pico & sour cream. 2 corn tortillas, stuffed with a blend of jack & cheddar cheese, choice of chicken, fish, asada, carnitas, ground beef or shredded beef. Topped with our homemade ranchera sauce, fresh pico, lettuce & sour cream. 2 corn tortillas filled with sautéed fajita veggies, mushrooms & a blend of jack & cheddar cheese. Topped with tomatillo sauce, garnished with fresh pico, lettuce & guacamole. Served with white rice & black beans. Two delicious handmade tamales topped with a Zesty Red Sauce, a blend of jack & cheddar cheese & garnished with fresh pico, lettuce & sour cream. Your choice of chicken or pork. Served with homemade spanish rice & refried beans. Two eggs on corn tortillas, homemade refried beans topped with a blend of jack & cheddar cheese, fresh pico, jalapeños, lettuce & a touch of sour cream. 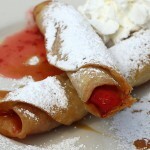 Served with flour or corn tortillas. A giant flour tortilla stuffed with homemade spanish rice, refried beans, fresh lettuce, fresh pico & two choices of the following meats: Chicken, shredded beef, ground beef, carnitas or fish. Asada available at extra charge. A flour tortilla stuffed with our homemade spanish rice, refried beans, & your choice of: Chicken, shredded beef, ground beef, carnitas or fish. Asada available at extra charge. A flour tortilla stuffed with our delicious homemade refried beans & a blend of jack & cheddar cheese. A flour tortilla filled with sautéed bell peppers, onions, tomatoes, mushrooms, white rice & your choice of black or pinto beans. 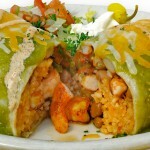 Stuffed with savory chunks of pork, homemade spanish rice & refried beans. This *highly rated* burrito is topped with cheese, fresh tomatillo salsa & avocado slices. A giant flour tortilla stuffed with homemade refried beans, spanish rice & your choice of asada, chicken, fish, carnitas, ground beef or shredded beef. Deep fried & sprinkled with cheese. Asada available at extra charge. All quesadillas are served with fresh guacamole, sour cream, lettuce & fresh pico. 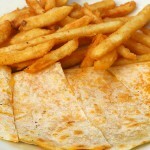 Our lightly browned flour tortilla, stuffed with a blend of jack & cheddar cheese. 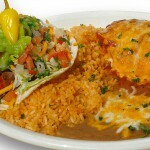 Our biggest flour tortilla stuffed with meat of your choice, a blend of jack & cheddar cheese & fresh pico inside. Choice of Chicken, Fish, Pork, Ground or Shredded Beef. Asada available at extra charge. A giant flour tortilla stuffed with shrimp, our fish of the day, fresh pico, cabbage, Baja Sauce & a blend of jack & cheddar cheese. 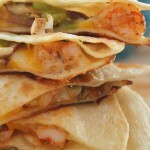 A giant flour tortilla stuffed with grilled shrimp, fresh pico & a blend of jack & cheddar cheese. Slow simmered pork in mexican spices, citrus juices, pineapple, topped with onions, cilantro & fresh salsa. A double wrapped corn tortilla filled with white rice, black beans, sautéed fajita style veggies & topped with our fresh guacamole. Choice of meat: asada, chicken, fish, pork, shredded beef, ground beef & al pastor. Substitute shrimp or fish of the day. Double wrapped corn tortillas topped with melted cheese, grilled shrimp, sautéed veggies, our signature spicy Baja Sauce, fresh cilantro & guacamole. All kids meals are served with rice & beans or french fries and a soft drink. Served with rice & beans or french fries and a soft drink. Choice of meat & topped with cheese. Asada or Shrimp available at extra charge. 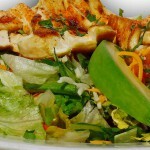 Served with rice & beans or french fries and a soft drink. Asada or Shrimp available at extra charge. Served with rice & beans or french fries and a soft drink. Add Asada or Shrimp at extra charge.